We invite you to become a local site school host for SCUDEM IV 2019 to be held on Saturday, 9 November 2019. SIMIODE, Systemic Initiative for Modeling Investigations and Opportunities with Differential Equations, announces this exciting program for undergraduate or lower students and faculty: SIMIODE Challenge Using Differential Equation Modeling (SCUDEM). We seek regional host sites and local coordinators for the SCUDEM IV 2019 challenge to be held on Saturday, 9 November 2019, 8:30 AM–4:30 PM local time, around the world. Please see the growing list of current Host Sites for SCUDEM IV 2019. Just because there is a site near you which is hosting, do not hold back on applying to host. We want to hear of your interest. For in some cases alternating sites, year after year, will serve both the region and the schools' commitment levels. We will work with all who wish to host, year in and year out, to provide a quality experience and help recruit visiting teams. Since registration for SCUDEM IV 2019 will open on 1 September 2019 we are asking schools who wish to host to apply before 15 August 2019 and we will work with hosts on a first come first served basis modulo proximity issues discussed above. So sooner is better! While students are working on an additional issue for their modeling projects at the local site, faculty engage in a meaningful Faculty Development program on using modeling in their courses. All teams have a $100 US Registration Fee. Host sites receive a stipend of half the registration fees, including all their own teams' fees, when the challenge is held at that local site. In the event of consolidation of sites the original host site full fee will be applied to the consolidating host site. However, in the event the local site decides to "stay at home" and do SCUDEM IV 2019 locally then half their registration fee will be returned to them. Due to the rich mix of interested faculty and students larger gatherings are encouraged over smaller or singleton events. Local sites are expected to provide meeting, presentation, workshop spaces and guest internet connectivity, and modest refreshments of coffee, tea, just, and goodies upon morning arrival. However, all participants are expected to pay for their own lunch in the institution's dining facilities. We provide information about the challenge and responsibilities involved in serving as a local host site. This is in our SCUDEM IV 2019 Local Site Host Coordinator Guide Book. We sincerely hope you consider hosting SCUDEM IV 2019 on your campus for this enriching and rewarding experience and help us further our goal of bringing differential equations modeling experiences to campuses. The student challenge, SCUDEM IV 2019, begins with registration which opens on 1 September 2019 and the challenge takes place over a week-long period that begins at each team’s individual home campus and culminates on Saturday, 9 November 2019, at a regional host site. Beginning at one minute after midnight on Friday, 1 November 2019, student teams access three modeling scenarios involving differential equations, posted at our SIMIODE website. Teams work at their home institution, developing approaches and solutions to their chosen modeling scenario. The scenarios are designed so that every team may experience success in modeling, building their skills and confidence in differential equations. We post all SCUDEM problems from previous competitions as well as all student submissions online at www.simiode.org/scudem. Each team prepares an Executive Summary and Presentation to bring to the regional host site on Challenge Saturday, 9 November 2019. There, student teams work on a small modification of the modeling scenario they have selected (for example, effects of new assumptions, variables or changes in parameters) for inclusion in their final submissions. Students are NOT to redo their model, rather they are to indicate how their model might reflect this new issue and what response they believe might occur due to this issue. As a regional host site, you host teams of three students each (undergraduate level or lower) as well as faculty coaches and other faculty attendees on your campus on Challenge Saturday, 9 November 2019, from 8:30 AM to 4:30 PM. In the morning and afternoon (one hour each) faculty participate in Faculty Development experiences to help them incorporate more modeling in their courses. SIMIODE provides complete, ready-to-go, and scripted materials which can be modified for a successful Faculty Development workshop. All faculty Development workshop materials from previous SCUDEM events are available at www.simiode.org/scudem. At registration students submit paper copies of their two page Executive Summary for faculty judging in the morning. Student teams address an additional issue to their problem as they refine and practice their Presentation, adding additional details, but NOT redoing their model. Upon completion of faculty judging of Executive Summaries and student completion of the additional issue in their model all gather and engage in a real-time modeling scenario. This is followed by a discussion of using modeling in teaching and learning differential equations and an overview of SIMIODE's rich resources to support this approach. At noon, students turn in the final electronic version of their Presentation to be judged by coaches and visiting faculty present, later in the afternoon. Immediately after lunch faculty resume their Faculty Development program in which deeper issues surrounding the use of modeling in differential equations courses are discussed while students participate in a fun MathBowl contest as a team. Challenge yourself with previous MathBowl questions at www.simiode.org/scudem. During the afternoon session at 2:00 PM, each team, in one of several tracks of four teams, gives a 10 minute Presentation, which benefits from audience feedback and is scored by coaches and visiting faculty. The challenge culminates with an awards ceremony rounding out the day by 4:30 PM to allow time to travel home. Award certificates for the modeling problem are at the Outstanding, Meritorious, and Successful levels and all teams receive one of these awards. Team award certificates for first, second, and third place in the student MathBowl are also given out. Guest Wi-Fi access for teams and coaches. We have prepared a detailed SCUDEM IV 2019 Local Site Host Coordinator Guide Book in which we attempt to address all issues and concerns for local site host coordinators. Collect registration forms and fees online from the schools ($100 US per each school team for all schools) beginning at least 8 weeks prior to the event. Provide all materials for the challenge - problems, forms, workshop materials, MathBowl. Offer complete, ready-to-go, and scripted materials which can be modified if desired for a successful Faculty Development workshop. Return to local site host coordinator one half the registration fees from visiting teams to the local site upon completion of the SCUDEM event. Invite selected, quality team efforts for publication as Modeling Scenarios at SIMIODE. We have created a SCUDEM IV 2019 Local Site Host Coordinator Guide Book to give an overview and a complete description of activities and responsibilities for serving as a Local Site Host Coordinator. It is based on effective and efficient activities for success and lessons learned from past SCUDEM events. We sincerely hope you will take part in this exciting initiative that brings students and colleagues to your campus and allows you to showcase your mathematics programs. We have found that a number of high schools and two-year colleges are offering differential equations courses and support student engagement in such challenges as SCUDEM. Hosting institutions are encouraged to invite non-participating students and faculty to attend the day's events: Faculty Development Workshop as appropriate, team presentations, the MathBowl, and the award ceremony. We have successfully offered SCUDEM I 2017 in October 2017, SCUDEM II 2018 in April 2018, and SCUDEM III 2018 in October 2018 and have placed complete results including statements of all challenge problems, supplemental issues for these problems, student response materials, MathBowl materials, and Faculty Development Workshop materials for SCUDEM I 2017, SCUDEM II 2018, and SCUDEM III 2018. 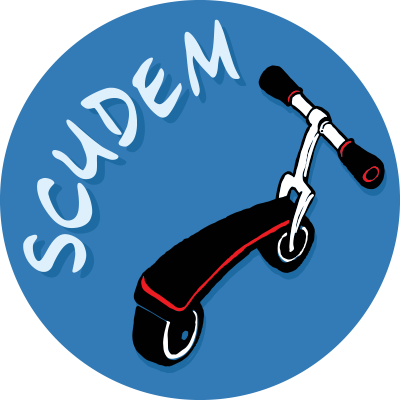 SCUDEM will now be an annual event held in early November of each year. You can find impressive and convincing videos about SCUDEM at our YouTube Channel and student experiences from one host sites Mount Saint Mary College, Newburgh NY for SCUDEM I 2017 , Springfield College, Springfield MA for SCUDEM II 2018, and University of Massachusetts-Amherst, Amherst MA for SCUDEM III 2018. In addition you can learn about how one team from Clackamas Community College, Oregon City OR USA approached their SCUDEM III 2018 problem. SCUDEM is sponsored by SIMIODE, Systemic Initiative for Modeling Investigations and Opportunities with Differential Equations, a 501(c)3 nonprofit organization. You can learn more about SCUDEM at www.simiode.org/scudem and about SIMIODE at www.simiode.org where we offer a community in which students and colleagues can learn/teach, communicate, collaborate, peer review publish, and explore topics in differential equations modeling. SIMIODE resources are entirely FREE.